Hearts in Atlantis is one of those books that has been on my shelf for so long that I can't really remember when or why I got it in the first place. 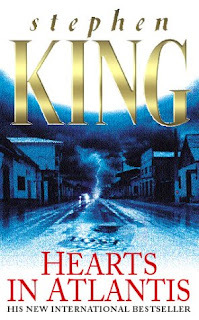 I seem to have a fair few Stephen King books that have cropped up in my collection, so I can only assume that I must have had a period where I picked up any of his books that peaked my interest, only to never get around to reading them. Hearts in Atlantis in particular may well have been picked up because I found out that there was a film version of it made starring Anthony Hopkins, an actor whose work I admire immensely. In any case, it had been sitting on my shelf long enough for me to feel guilty about it. Hearts in Atlantis is a collection of five interlinked stories set between 1960 and 1999. The first "Low Men in Yellow Coats" follows a young boy named Bobby as he befriends a new neighbour who asks him to keep an eye out for strange and unpleasant individuals that he only names as Low Men. "Hearts in Atlantis" follows Pete Riley in his attempts to win the heart of a fellow student, all while trying not to flunk and avoid the draft for Vietnam despite a crippling gambling habit. "Blind Willie" follows Willie Shearman as he cons busy New Yorkers out of their money by pretending to be a blind Vietnam vet. "Why We're in Vietnam" follows Sully-John revisiting the past following the funeral of a fellow veteran. And finally, "Heavenly Shades of Night are Falling" focuses on a grown up Bobby revisiting his childhood hometown and brings together all the tales that had come before it. Apart from the first story in the collection, there isn't really much in the way of supernatural goings-on in Hearts in Atlantis, which was a bit unexpected but not really a bad thing. Considering that the last book by King that I'd read before this was The Stand, it was actually kind of nice to read a novel where the main bad guy wasn't the Antichrist. Much as I like The Stand, there needs to be variation in terms of stakes, and I certainly got it here. It was nice to read something where in the end, even if the good guys don't win completely, the world doesn't have to come to a screeching halt. It was good to read a book where the consequences were all so close to home, and the recurring characters really hammered that home, as you can see just how all of these events affect them all while the world continues on as normal. I will say one thing though that I wasn't so sure about. I can't say for certain, not having read any of the Dark Tower series of books, but I feel like there's a lot of context from that series that would make the supernatural elements of "Low Men in Yellow Coats" make a lot more sense. It certainly isn't essential, as the important points come across just fine and don't actually need to be explained in full. I just feel that, having seen the use of terms like "breakers" and "te-ka", there is a lot of context that would take on a lot more meaning if I had already read at least some of the Dark Tower books. Probably not a huge issue, but it might well tip the balance of which you read first.